It's been a long time since we turned the tables on a fashion designer and questioned them about their shopping habits. 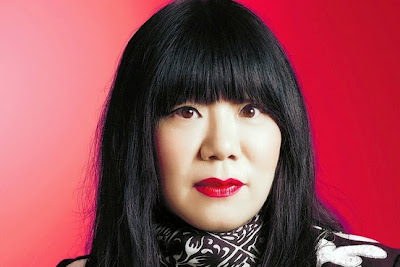 Last week, we were lucky enough to catch up with Anna Sui at the launch party of her new fragrance. La Nuit de Boheme is the designer's 13th perfume and was conceived as the evening accompaniment of La Vie de Boheme. The "evening fragrance" has a floral-woody-fruity sent with a hint of midnight mystery and a dash of sensual. "She is a girl-child woman who lives life on the edge, expressing her freedom and individuality. 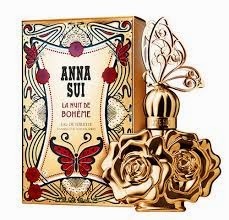 But at night," Anna Sui continues, "she turns into another girl entirely. A girl full of mystery and sensuality." Besides having a intoxicating fragrance, La Nuit de Boheme comes in a bottle that is both decorative and extravagant. The design is emmbossed with black and gold filigree and is full-on luxe bohemian. Not too much of a deviation from Anna Sui, herself. Below Anna Sui shares her prized wardrobe items along with a few heart breakers. Read below to find the full scoop and let us know what you think. Click here to read though more of our Retail Therapy series. I love the flea markets. Great finds are becoming harder and harder but they have always inspired me. Most of what's in this store [the designer's Soho boutique] was found at flea markets. My favorite is the one on 26th Street. I am always looking for that one item I didn't buy. At one point, the markets were stocked and now you can hardly find a thing. I now have the philosophy: If you love something you see, buy it. You might never find it again. A great coat. I haven't bought one in a few years. I made some great ones for my collection this year. Some with real fur and some with fake fur. A coat really makes a statement. In winter, sometimes it's the only thing people see you wear for months. If you see it, buy it.